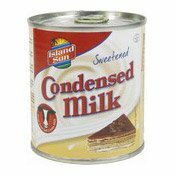 Description: Island Sun is the best full cream sweetened condensed milk, ideal for making a variety of sweets and desserts, but out absolute favourite must be condensed milk in coffee. Store in a cool and dry place. Once opened, transfer in a suitable container. This product is not intended as a food for infants under 12 months. Simply enter your details below and we will send you an e-mail when “Condensed Milk (Sweetened) (煉奶)” is back in stock!